If there was one thing we totally appreciated about Mentawak Chalet, it was Mentawak's simply awesome location. I mean, it's pretty much right on the beach. By the way, Juara Beach isn't just any beach, it's actually been voted as one of the world's top beaches by CNN. The best part of Juara, apart from the way it's remote and quite a ways away from the bigger crowds over at the west coast of Tioman, is the fact that Juara is still relatively untouched. It's not for nothing there's a turtle sanctuary at the end of Juara. The reason is that turtles still come ashore in decent numbers here to lay their eggs. How beautiful is that? One of the reason could well be the very clean sea water and the clean beach itself. The sea is really clear here, so clear that we went snorkeling quite a few times, because we wanted to see the coral reef out front. I don't think the coral is at extensive as the other side of the island, but there's plenty of marine life to enjoy. The other good news is that there were no sand flies. I mention this because I read a few reviews about Juara having sand flies. Lucky, Mentawak is free of these little critters. Let's hope it stays that way. Mentawak offers just 4 cottages, so you need to book pretty much in advance to make sure you can score one. The rates are pretty friendly, given that Mentawak is considered a budget accommodation. The cottage, or chalet, offers a comfortable bed, a mosquito net, a kettle and a sea-facing balcony. There's all kinds of water activities up for grabs and you can rent a bicycle too. On yer bike :) The more intrepid travelers can ask Mentawak to set them up with a mountain hike or a visit to the water fall. Now, Mentawak's idyllic remoteness does come at a slight price, as it's not exactly close to the Tekek jetty, which is the point at which you need to disembark your ferry arriving from the Malaysian mainland. That said, Tioman is a pretty small island, so nothing is quite far. Besides, the taxi ride we took from Tekek to Juara was exhilarating, seeing as that it cuts right through the middle of the island, which so happens to be a thickly jungle-covered mountain! The ride is at times quite steep and the jungle on either side is throbbing with energy and jungle-type ruckus. It almost felt like we were on some Safari. We were half expecting an elephant or something to appear out of the dense foliage. So if you've decided to stay in Mentawak Chalet, ask your driver to drive a little slower, so you can enjoy the experience. Speaking of experiences, I was told that Mentawak has good surf during the monsoon months. So if you're into surfing, then this is the place to be in January and February. No surf when we were there, but you can kind of see how the surf can be good here, because even during the low season, you can still see occasional little swell roll in. Tip: If you want your taxi to await you when you arrive in Tekek Village, then you can call Didi of Juara Taxi on +60 1770 94585. Didi will be there when you tell him your ferry arrival time. As for booking your Mentawak chalet, as stated above, it makes sense to book it ahead. 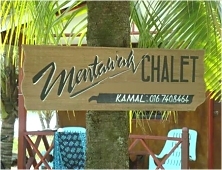 You can either try calling Mentawak on +60 11-25646610, or just book your Mentawak Chalet room direct on Booking.com. Do note that there's no internet here and also pets are not permitted.